This gluten-free recipe for Vietnamese Donuts (Banh Cam Banh Vong) makes amazingly crispy donuts with a delightful sugar glaze. If you love decadent fried treats (and who doesn’t? ), this is a must-try recipe. The donuts have a really unique texture. They are crispy on the outside, softy and chewy on the inside–similar to crusty and chewy bread but much sweeter. Half of the donuts are filled with a sweet mung bean filling and the rest are donut rings. 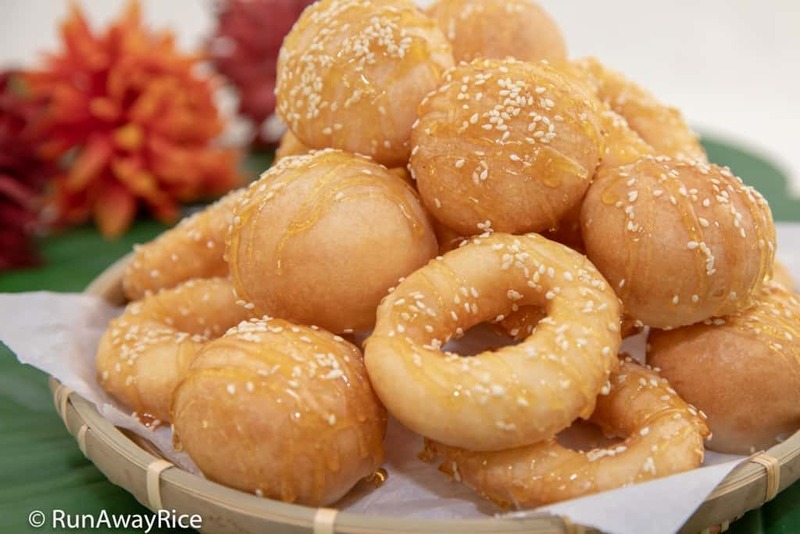 These Vietnamese Donuts aren’t every day treats, but once in awhile, indulging in deep-fried goodness is so satisfying. Be prepared, these donuts are tantalizing and completely addicting. Enjoy! To save time, make the mung bean filling a day or so ahead. 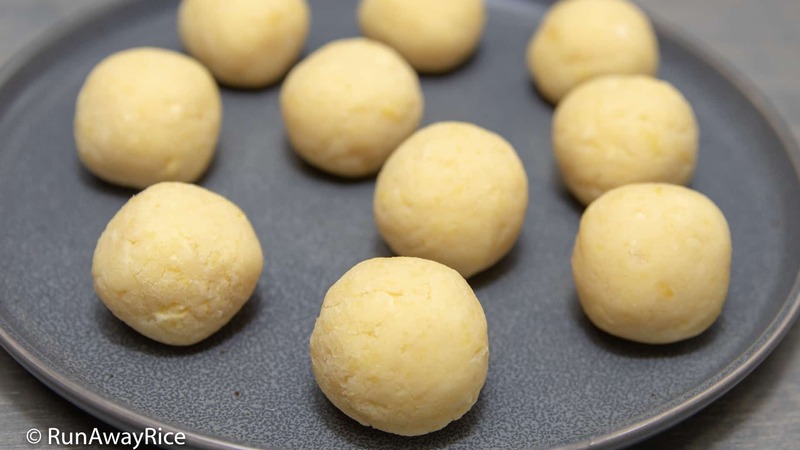 Before making the donuts, warm the filling balls in the microwave to soften and make them easier to shape. The mashed potato is the secret ingredient in this recipe. The potato gives the donuts structure and helps them to not explode during deep-frying. Do not omit this ingredient. For a recipe shortcut, use instant mashed potatoes. When making the dough, add the hot water and sugar mixture gradually while mixing on Low speed. Depending on the quality of the flours, you may not use all of the liquid. As soon as a dough forms, stop adding the liquid but continue mixing and letting the dough set up. The dough should be soft, moist and pliable but not sticky. If the dough is still dry after adding all the water and sugar mixture, add more hot water, 1 Tbsp at a time and mix together. 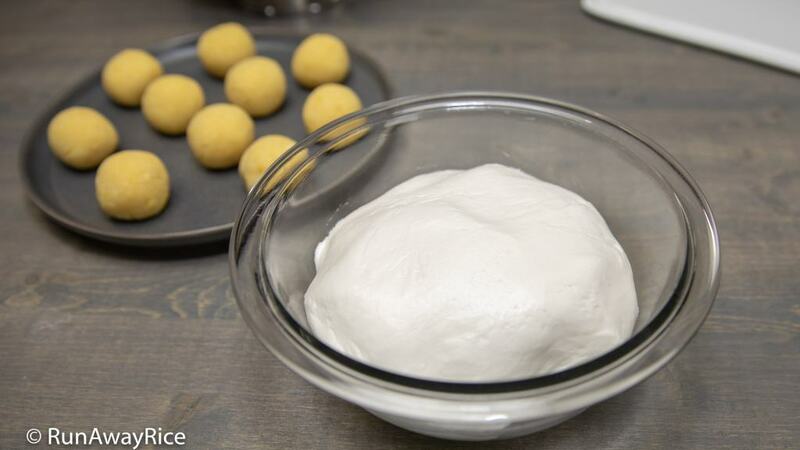 If the dough is too sticky, add more glutinous rice flour, 1 Tbsp at a time and mix together. You do not need a stand mixer and can mix the dough by hand. Of course, the stand mixer makes the task easier. This dough is sensitive to heat. Initially, fry the donuts at lower temperatures, 265-270 F (129-132 C), to let the dough puff up evenly. Frying at high temperatures will cook the outside dough quickly while leaving the inside dough raw. After the dough has puffed up, approximately 5-6 minutes of frying, increase the heat to brown the donuts. I increase the heat to Medium so the oil is bubbling gently, approximately 300-315 F (148-157 C) and fry the donuts until they are golden, approximately another 6-7 minutes. Fry the donuts with the mung bean filling after the rings. It’s common for a filled donut to break open during frying. Frying the filled donuts last helps to keep the oil cleaner for longer. If a donut breaks apart, remove it from the pan right away so the oil isn’t contaminated. Fry the broken donut last or in a separate pan. 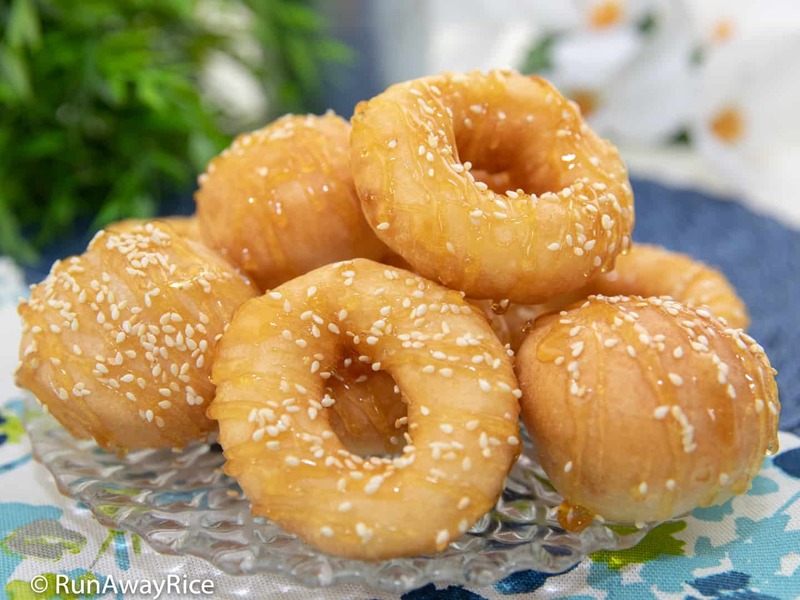 This gluten-free recipe for Vietnamese Donuts (Banh Cam Banh Vong) makes amazingly crispy donuts with a delightful sugar glaze. If you love decadent fried treats (and who doesn't? ), this is a must-try recipe. The donuts have a really unique texture. They are crispy on the outside, softy and chewy on the inside--similar to crusty and chewy bread but much sweeter. Half of the donuts are filled with a sweet mung bean filling and the rest are donut rings. 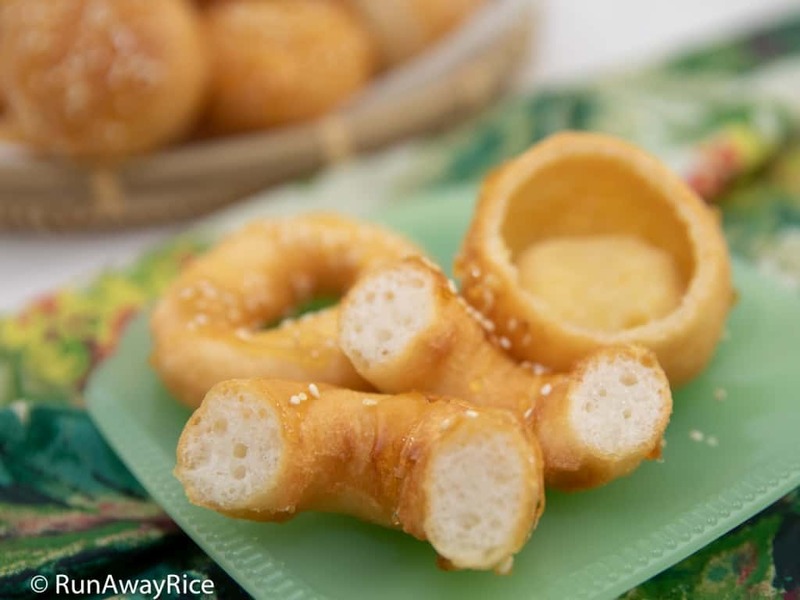 These Vietnamese Donuts aren't every day treats, but once in awhile, indulging in deep-fried goodness is so satisfying. Be prepared, these donuts are tantalizing and completely addicting. Enjoy! Transfer the mung bean into a large bowl and fill with cold water. Wash the beans by swirling in the water and then pouring out the rinse water. Repeat this process 2 more times or until the water is mostly clear. Fill the bowl with cold water and let the beans soak for at least 2 hours. Wash the beans one more time. Drain using a colander. Transfer the beans into a rice cooker. Add the salt and water. Spread out the beans into an even layer. Close the lid and cook using a basic white rice setting. Transfer the cooked beans into a medium bowl. Add the sugar, vanilla sugar and vegetable oil. Using a paddle spoon, mash the beans while still hot. Use a medium cookie scoop to transfer small filling mounds onto a plate, making a total of 10 mounds. Roll the filling mounds between your palms forming a rough ball. After all filling balls are made, cover with plastic wrap to keep from drying. Remove the potato skin using a vegetable peeler. Dice the potato. Transfer the potatoes into a small saucepan. Add 1/2 cup water. Cover and cook the potatoes over Medium heat until soft. Mash the potatoes using a spatula or spoon. Combine the 1 cup boiling water and sugar in a measuring cup. In the bowl of a stand mixer, add the glutinous rice flour, rice flour and baking powder. Mix on Low speed for 15 seconds. Add 1/3 cup mashed potatoes (prepared earlier) and the vegetable oil. While mixing on Low speed, gradually add the water and sugar mixture until a dough forms. (This takes approximately 2 minutes.) Cover the dough and let rest for 30 minutes. After the resting period, mix on Low speed for 30 seconds. Cover the dough with plastic wrap or a kitchen towel to prevent drying. Use a medium cookie scoop to pick up a small mound of dough. Flatten the dough between your palms. Using your fingers, flatten the edges, making a circle about 3 inches in diameter. 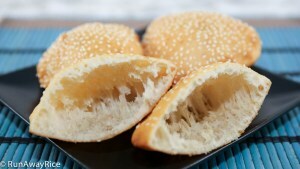 Place a mung bean filling ball in the center of the dough circle and wrap the dough around the filling. Pinch the dough together covering the filling completely. Roll between your palms to form a smooth ball. Leave the donuts round or flatten into a small patty. Transfer the donut to a large plate and cover with a damp towel. 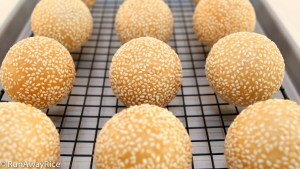 Continue with the same steps until all the mung-bean filled donuts are made. For the remaining dough, use a medium cookie scoop to transfer small mounds onto a plate. Roll each mound into a rope about 5 inches long. Join the ends together making a ring. Continue making the donut rings using the remaining dough. In a large wok, add the vegetable oil. Heat the oil over Low heat until the temperature is approximately 265-270 F (130-132 C). 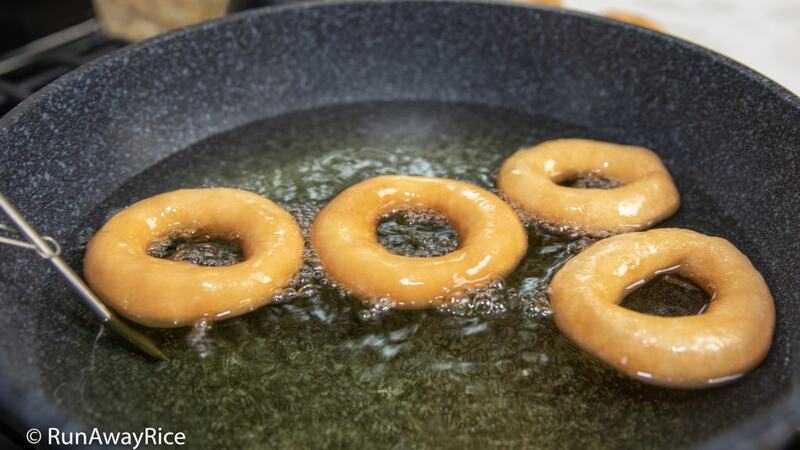 Carefully transfer the donuts rings into the oil. Separate the donuts so they don't stick together. When the donuts float to the top, flip them over. For the first 5-6 minutes, flip the donuts every 1 minute so they puff up evenly on both sides. Increase the heat to Medium and fry the donuts until they are golden. Transfer the donuts to a plate lined with paper towels. Blot off the excess oil. Fry the donuts with the mung bean filling following the same steps above. In a small saucepan, add the sugar, vanilla sugar, water and lemon juice. Combine together and moisten the sugar. Heat the sugar over Medium heat. When the syrup starts to bubble vigorously, swirl in the pan a few times and return to the heat. Cook until the syrup turns a honey color, approximately 4-5 minutes. Turn off the heat. Let the syrup rest for 2-3 minutes or until it deepens in color. Drizzle the glaze on top of the donuts. Optionally, dip the donuts into the glaze, coating one side. 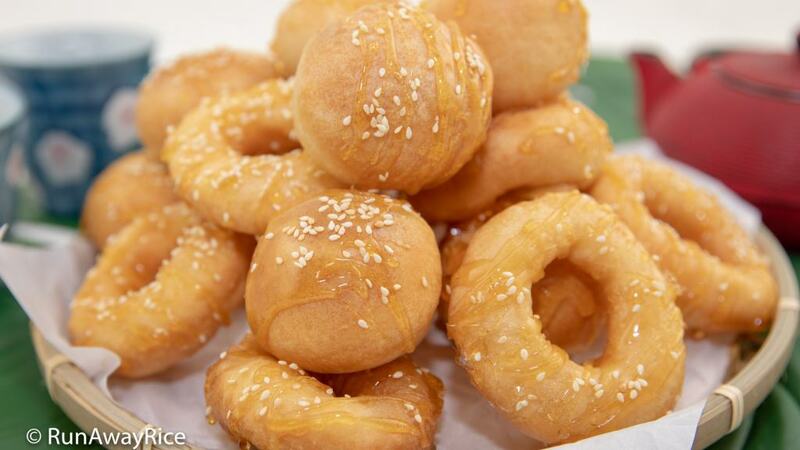 Sprinkle roasted sesame seeds on top of the donuts while the glaze is still hot. Enjoy the donuts while they're fresh. Store any remaining donuts in a covered dish and enjoy within 1-2 days. For a recipe shortcut, use instant mashed potatoes. The dough is sensitive to heat. Initially fry the donuts at lower temperatures, 265-270 F, to allow the dough to puff up evenly. Then increase the heat to brown the donuts. Avoid frying the donuts at high temperature which quickly cooks the outside dough but leaves the inside raw. 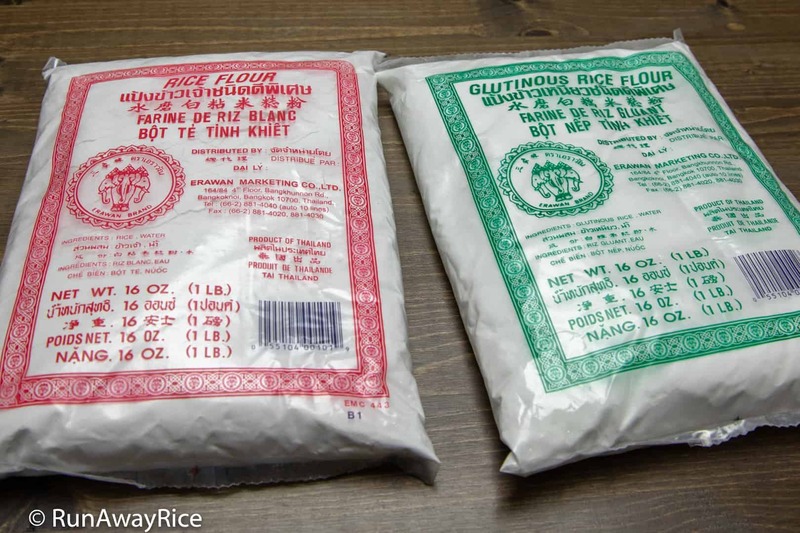 Do you know the differences between glutinous rice flour and rice flour? 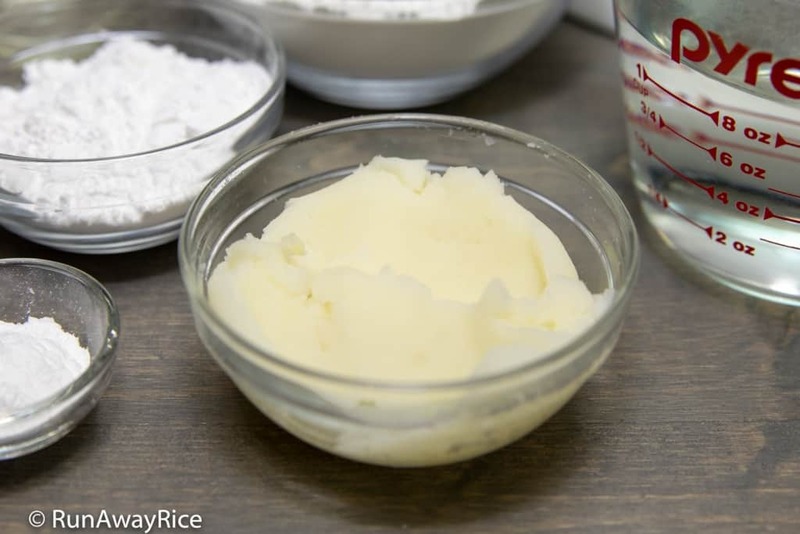 Check out this post to learn more: Rice Flour vs. Rice Flour – What Are the Differences? Instant Pot – Hype or Here to Stay? I have made them today, they are delicious. They do burst though. I did adjust the temperature slightly, and it seems to help a bit. Also, I did not have a plain rice flour, and added tapioca starch instead. They did come out nice, crunchy outside and chewy inside. They were sweet enough for me, so I did not make a syrup. Thank you for sharing! We love Vietnamese food! My husband is a sweet lover so I regularly try new sweet dishes. But going to try Vietnamese recipe first time. Hope this recipe goes well with me. A yummy recipe looks and sounds delicious! 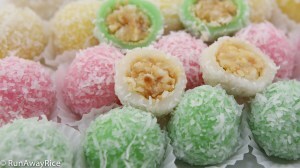 These Vietnamese Donuts have been a favorite of mine for a long time now. My mother-in-law made them for us when we visited her but I was too shy to ask for her secret recipe. Using your easy recipe, I made the donuts the other day for my family and they loved them so much! We ate the entire batch that day…can you believe it? We try to eat less sugar too so I drizzled the glaze on the donuts like you did. Do you think we can use brown sugar or palm sugar instead of white sugar for the glaze? Many thanks! I am thrilled to hear you like my recipe and it’s one you’ve been wanting to learn. It’s a wonderful sweet treat and so much fun to make. 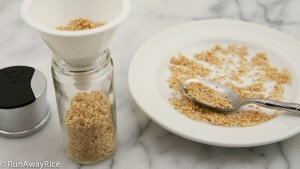 Yes, you can use brown sugar or palm sugar instead of white sugar. Palm sugar is delicious and easy to cook because it doesn’t burn like white sugar. Brown sugar is rich and delicious too. You can’t go wrong either way. Enjoy! Hi Trang, look good, I will try to do it. Thanks for your post up.